There was so much cash seized from Mr. Tandon’s law firm and home, the police needed six suitcases, four steel trunks and three cars to haul it away. $13.6 million was seized from Mr. Tandon’s law firm in cash in October. His law firm was raided a second time in December and police located another $2.7 million in cash. 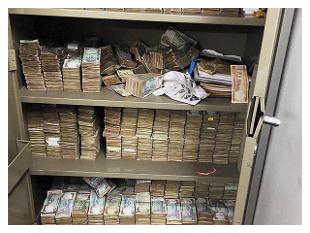 Mr. Tandon’s home was also raided and an additional $3.6 million in cash was located. Additional raids took place at other locations. Mr. Tandon was incarcerated after being charged with money laundering. A safe at Mr. Tandon’s law firm. Mr. Tandon alleges that he can account for the money and that some of it belongs to clients of his firm. But India has gone through what is called demonitization to control corruption and tax evasion and some of the cash located at Mr. Tandon’s office is currency that was not available for circulation. Subsequent to the October raid, Mr. Tandon declared a sudden income of $24 million to tax authorities. Investigators have located two mansions he is alleged to own in Dubai and London, as well as three luxury homes in India. The police became suspicious of Mr. Tandon after he hosted a lavish wedding for his son that was inconsistent with his reported income. A bank manager in India has also been arrested for money laundering in connection with the case for providing banking services to Mr. Tandon’s law firm in connection with the funds seized and is also incarcerated pending trial. The financial crime authorities are contacting banks in London and Dubai for asset freezes, according to the police.